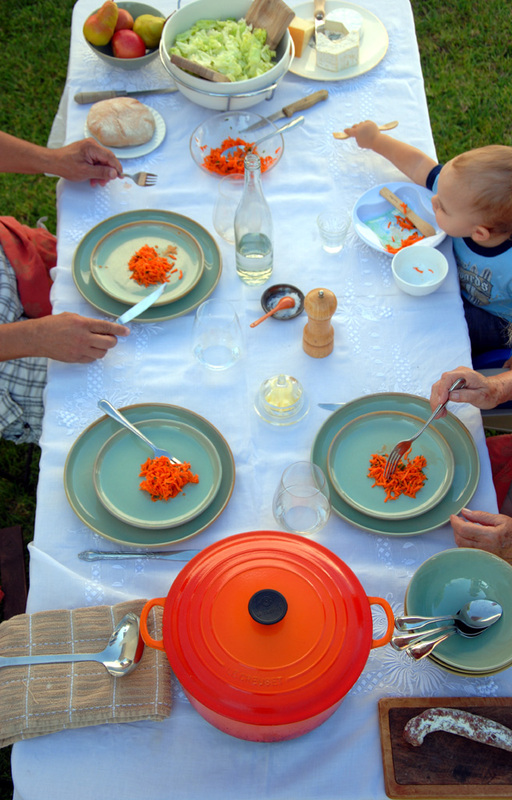 A blog about family cuisine & the education of taste, French-style! I've found your menus so helpful! I'm looking forward to Pablo's 8-12 month menus. Your blog has helped me plan my baby's meals, thank you for sharing! Hi Sara, thank you for your comment, I'm so glad the menus have been helpful to you! I've been meaning to update the 8-12 months section for a while, now you're giving me extra motivation to do so quickly!! :-) Wishing you many delicious meals for 2013! Hello Helene - I have been following and finding much inspiration from your blog for some time now. I have a 13 month old son and have feeding him a wide variety of foods since he was about 5 months. However, he's getting a little pickier and less accepting of his food at mealtime and I was wondering - did you go through this with Pablo? If you have any practical advice, I'd love to hear it. Does Pablo ever refuse foods, and if so, what do you do? Also - do you give Pablo any drinks besides water? Milk? Thank you for writing such a beautiful blog - you've been a huge help! Hi Lisa, thanks so much for following the blog and for the kind words, so glad the blog has been helpful! As far as drinks, Pablo (22 mo) still drinks about 12-16 oz a milk a day, 3 times a day but not at meal times, usually at least 1 hour from the meals. Other than that, just water. The only little bit of juice he gets is fresh squeezed OJ or grapefruit juice with breakfast (a few sips, maybe 1-2 oz max). Re: the refusing foods, you may want to check out this post with some of my strategies, see if it helps: http://frenchfoodiebaby.blogspot.com/2012/12/salmon-wrapped-leeks-au-gratin-and-7.html. I would first and foremost remember that children do not starve themselves, so if he's hungry, he will eventually eat. Infants and toddlers know how to listen to their bodies, so my job is to offer the right foods in the right quantities, and he decides how much to eat. However, I wouldn't give in to more snacks if he doesn't eat at mealtimes, that's a vicious circle (What's his snacking like at the moment?). I guess my main tip would be to stay cool, nonchalant about it, try to not let it stress you out or go into power struggles, keep offering and engaging with the meal, and remember this is just a phase... Hope that helps a little, feel free to contact me if you have other questions! I've been enjoying everything you post here but only commented now. Thank you for all the ideas and recipes you've shared here. It made my life as a new mom much easier. Your blog also made me more adventurous in what I give my almost 9 month old son. All the best! Hi I am am big fan of education of taste and I am a european living in the US raising a 6 month old. I have noticed in your early days menu (4-6 months) you have used a lot of potato with green beans, asparagus, leek etc. Are potatoes good for babies or you are referring to sweet potato? I have been reading your posts regularly which is specially for Traditional food in cambodia.I need to say that you are doing a fantastic work. Please keep it up the great work. What size are the potatoes you use? I love to hear from you, and reply to every comment. Never miss a recipe, follow me by email! Books and other products mentioned in the blog are often linked to an Amazon Associates account whereby I earn small commissions on products purchased.